Since it’s that time of year again (and now that time is all year around–um, have you tried samoas ice cream? Go do it now, we’ll wait), can we take a minute to talk about cookies? More specifically Girl Scouts cookies? Even more specifically the Girl Scout logos? Ways to make your company stand out are infinite, and unique branding is often successful; In 1971 the Girl Scouts turned to the great Saul Bass. Girl Scout cookies have inspired watering mouths since 1912. The response is down right Pavolvian. But recently the iconic logo got a haircut…literally. 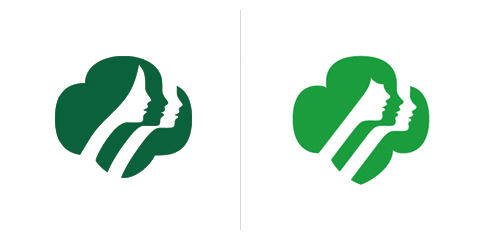 The newest rendition of the Girl Scouts logo has brand new bangs thanks to The OCD Agency. The logo is made up of three girls (ladies?). The profile closest to the viewer now dons a distinctly rounded fringe. But why change something so minimal?This must be an attempt to keep the logo fresh and modern without losing the everlasting essence of the brand–think about it, a simple haircut goes a long way (just ask any person stepping out of the hair salon). The trim was an astute choice for the brand looking to freshen up, but not completely redesign. The Girl Scout business has lasted over one hundred years, so it’s obvious they have made some smart branding choices (not to mention a yummy product).The Girl Scout colors include green, brown, and white–all of which inspire a feeling of the natural world. Just within the logo the colors are green and white, which is a soothing combination (not that one needs extra comfort when indulging in a box of Tagalongs). In fact, it is the union of color, image and form that allow the logo to look like a tree or a clover at a glance. 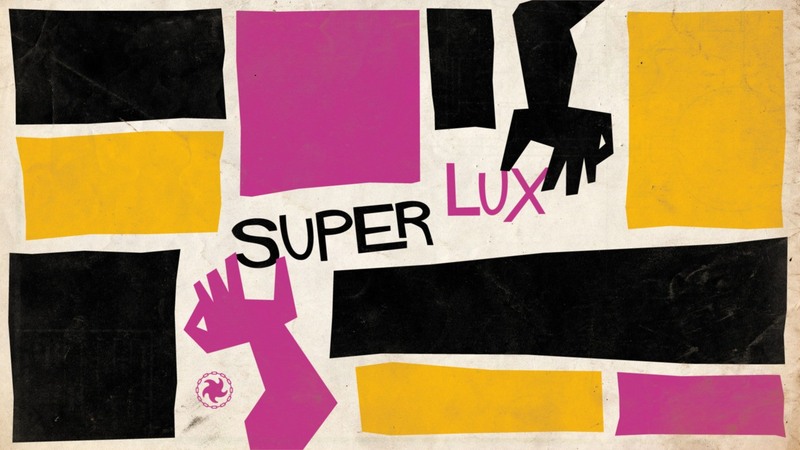 Superlux focuses on design first because it is paramount to how a brand is identified. It is your first impression. Good designers know how to play with the viewer’s perception in order engage the subconscious. Saul Bass used Gestalt’s (German word for form or shape) principles of continuation and proximity to create the three profiles that seem to make up a clover, or what is referred to as a trefoil. Symmetrical trefoils are often used for warning symbols for hazardous materials so that if the container is turned in any direction it is still easy to recognize (but, thankfully, GS cookies can only be hazardous to waistlines). For the Girl Scouts, the trefoil leaves embody their threefold promise: “To serve God and my country, to help people at all times, and to live by the Girl Scout Law.” In fact, the Girl Scouts even have a cookie called the Trefoil that takes after the appearance of their logo. In the Girl Scout trefoil the first profile is smoothly connected to the second and the third completes the shape. Bass’ design is a fantastic combination of color and branding work because it relays the mission of the Girl Scouts to a viewer ostensively. The faces of the silhouetted women seem to have changed as well. Of course, over the past one hundred years the “trendy” appearance of women has changed. Yet, a woman’s bone structure hasn’t gone the way of the dodo—or evolved toward the particularly buttoned-nosed…So why change the faces of the Girl Scouts? Compare the older logo to the most recent updated logo and see how the faces have become more “feminized.” The newest logo the women have softer features, higher (button-like) noses, and fuller up-turned lips. The augment could be a design choice made in an effort to equalize the roundness of the new fringe. It is also likely that it was updated to represent a contemporary notion of beauty.The design for the Girl Scouts logo is incredibly smart and subtle if not somewhat subliminal (but, hey, what message isn’t these days?). To focus on insightful design is the only way to build a lasting brand. Now who else really wants cookies? 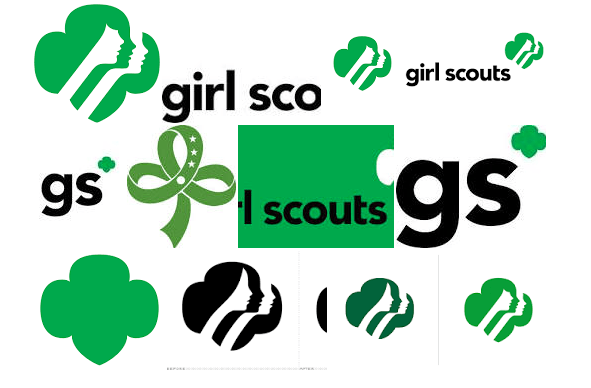 Just make sure you don’t mix up the Girl Scout logo with other trefoils!